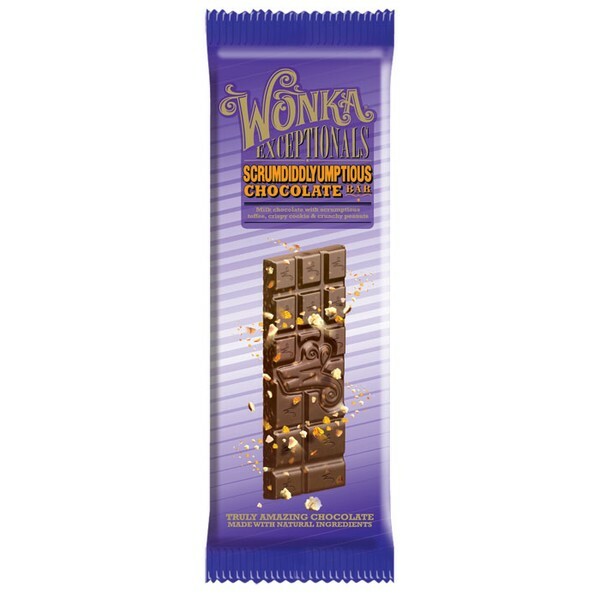 A couple of weeks ago I got the chance to review some of the Wonka Exceptionals Chocolate Bars. They were all pretty fabulous but the Triple Dazzle Caramel Bar spoke to me. No really it did. It said something along the lines of eat me now, I’ll go straight to your bottom but I’ll be delicious the whole way there. So I did it what it wanted of me. 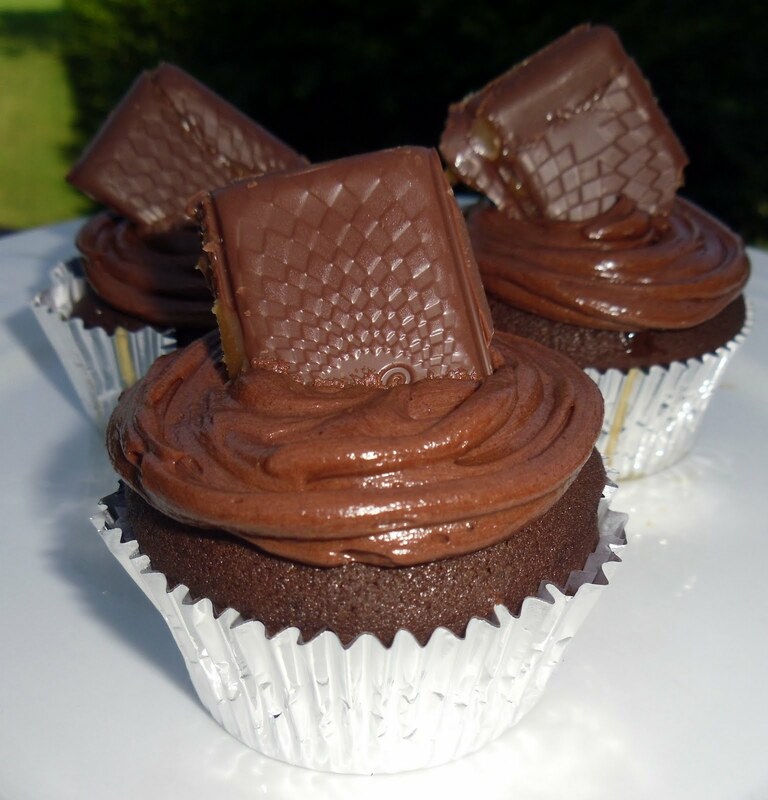 And as I was eating the chocolate bar an idea for a cupcake came to mind and the Triple Dazzle Caramel Cupcake was born. Slowly add sugar and mix it up! 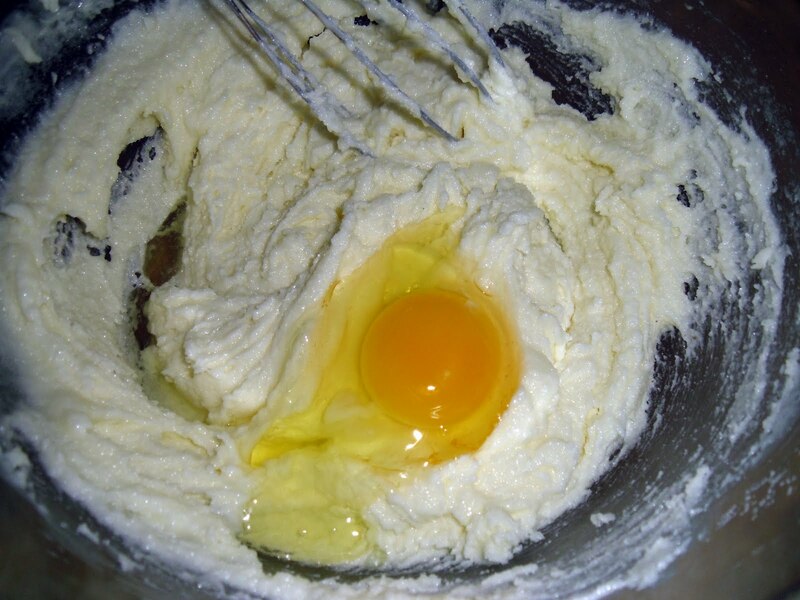 Once all the sugar is added, add each egg one at a time beating after each egg addition. 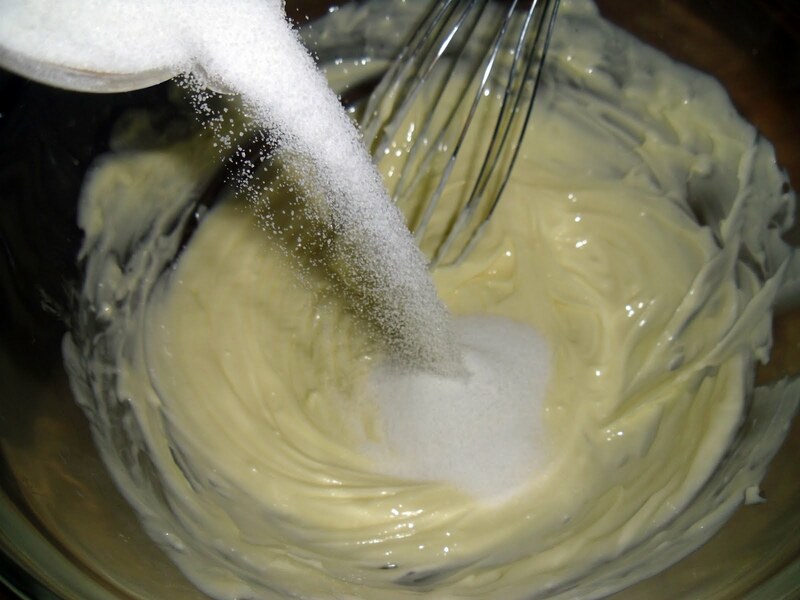 In a separate bowl combine the flour, baking soda, baking powder and salt. Once the chocolate mixture is completely cool you want to gradually add the chocolate mixture and the flour to the egg/sugar/butter mixture. Start by adding some of the flour mixture. 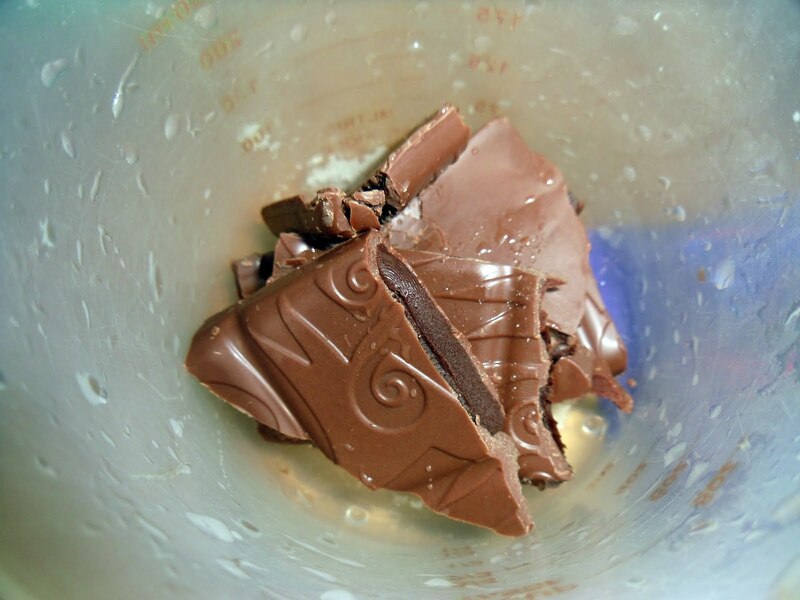 Mix it up and stir in some of the chocolate mixture! Once that’s mixed add more of the flour mixture and stir. 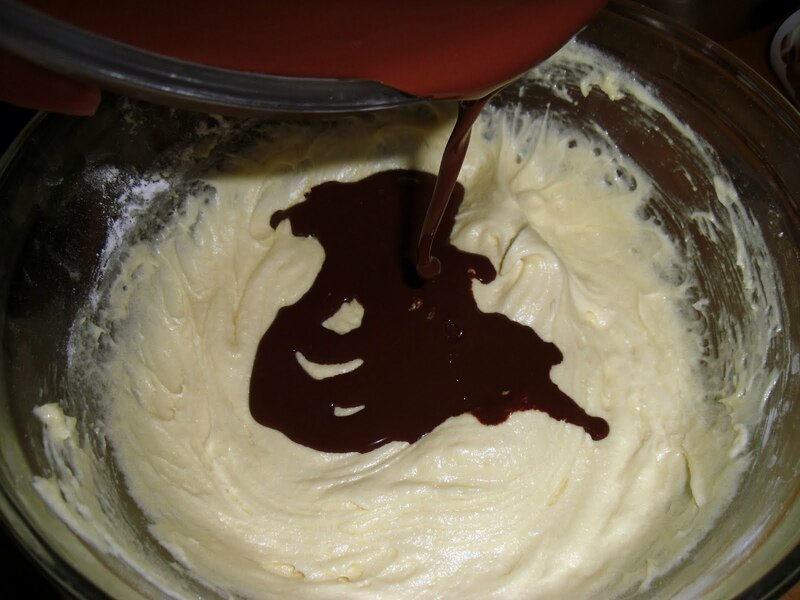 Then add the rest of the chocolate mixture, mix it up and then put the last of the flour in and stir. Now you want to take half a bar of the Fantabulous Fudge a dash of cream and melt it. 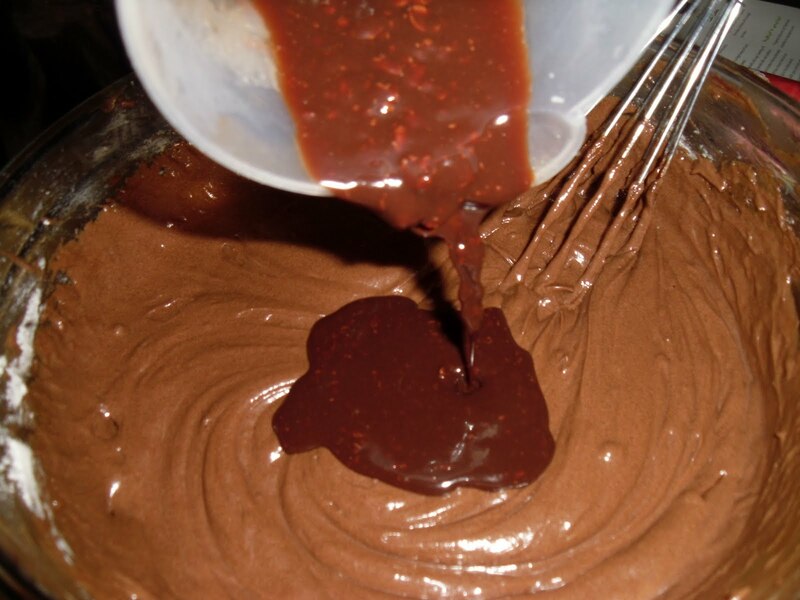 Then add it to your chocolate cake mixture! 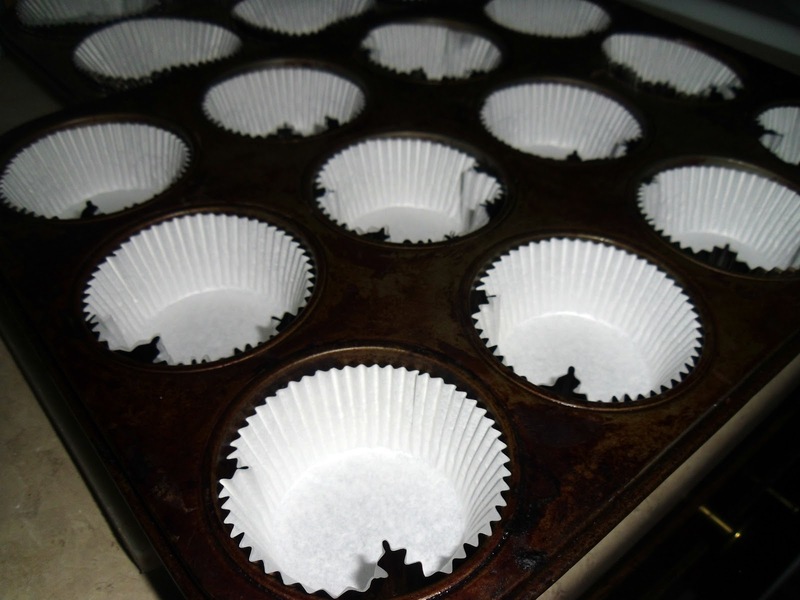 Now you want to line your cupcake pan with liners. And fill it up about 2/3rds of the way! 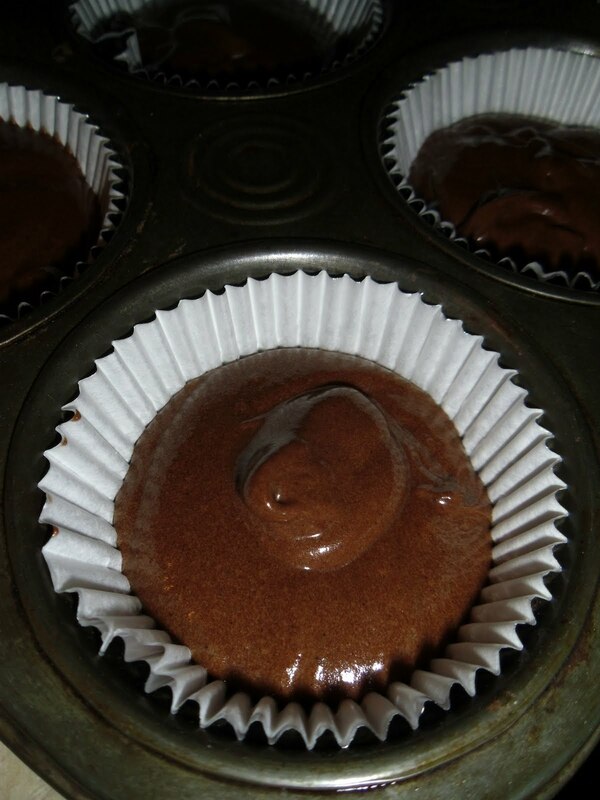 Pop them in the oven for appx 10-12 minutes and while they’re baking you want to make the frosting! 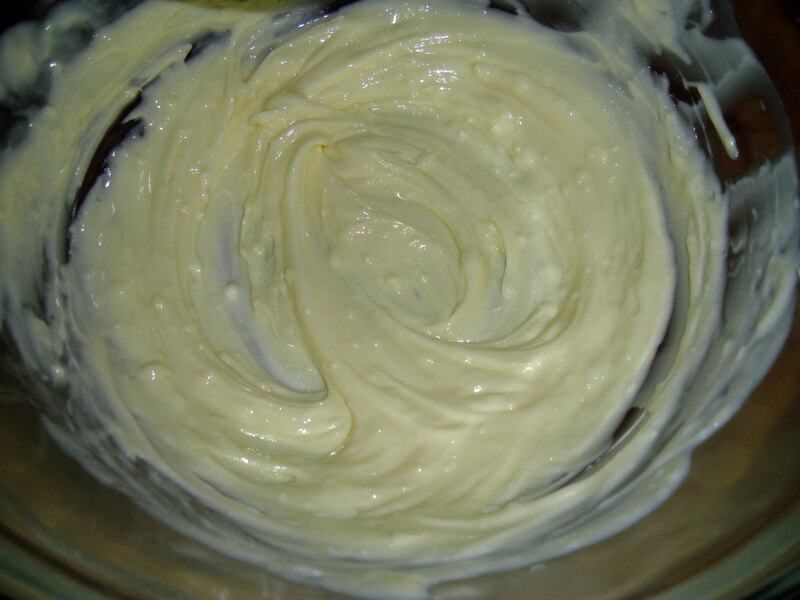 First put 1/2 cup of butter, 1/2 cup unsweetened cocoa powder, 1/3 cup whipping cream and 1/8 teaspoon of salt in a bowl and combine! 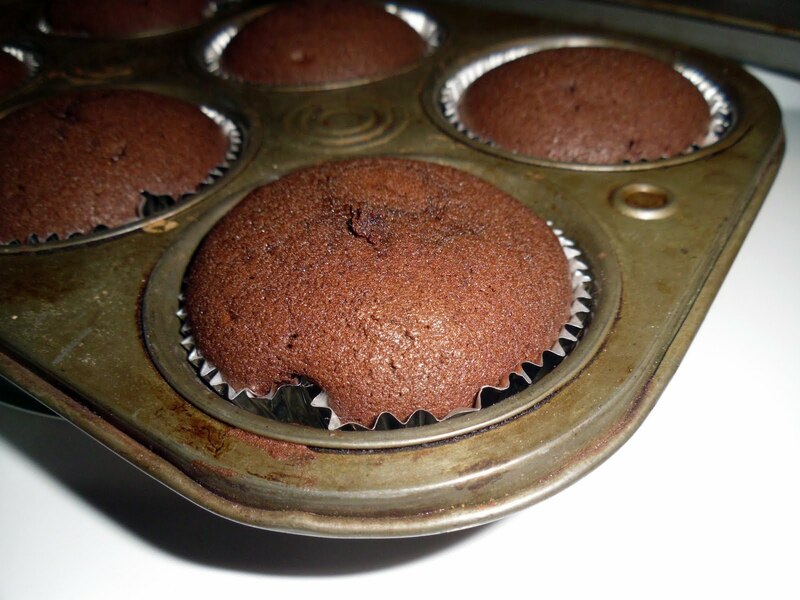 By now your cupcakes should be just about done so take them out of the oven and let them cool! Now it’s time to make the caramel sauce! 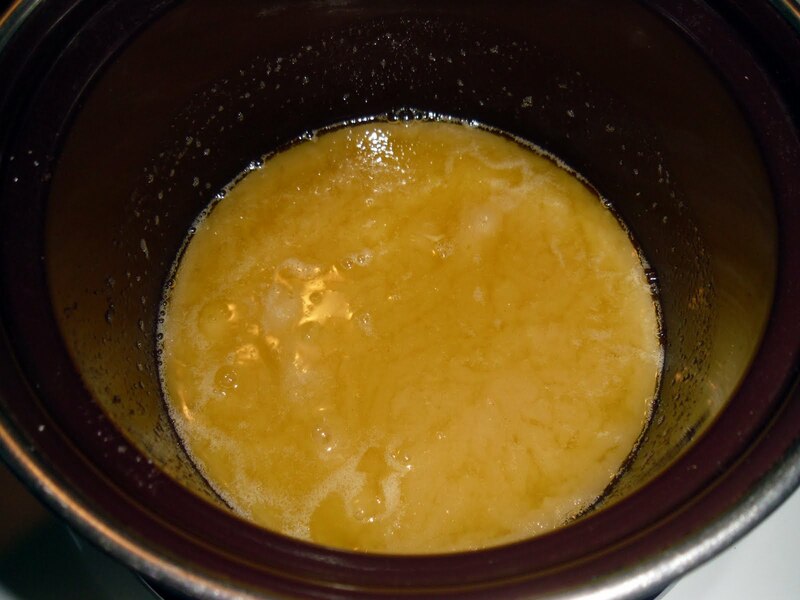 On high heat cook 1/2 cup butter and 1 cup of sugar for 4-5 minutes stirring occasionally, the mixture will be caramel colored! 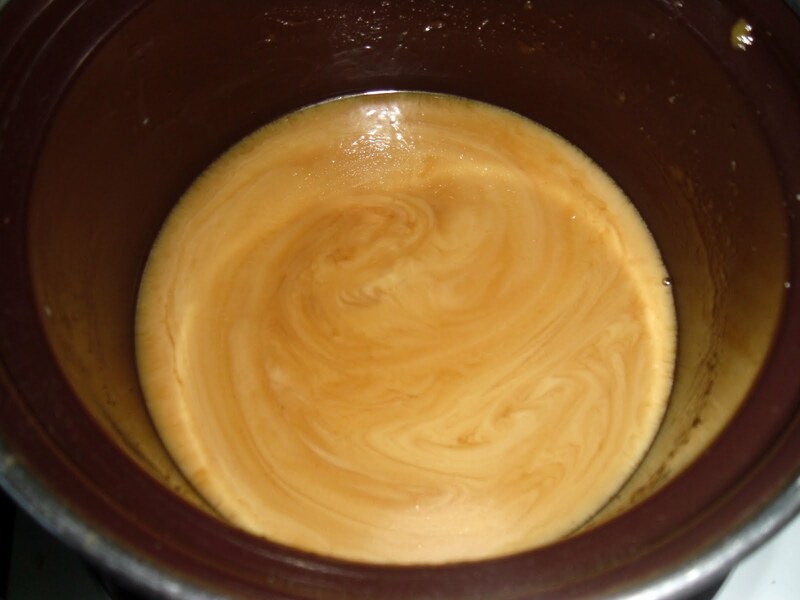 Remove the Caramel from heat, SLOWLY add cream, stirring constantly. Return to heat and bring to a boil, cook for another 1-2 minutes. Now that the cupcakes have cooled you want to poke holes in them with the bottom of a wooden spoon! 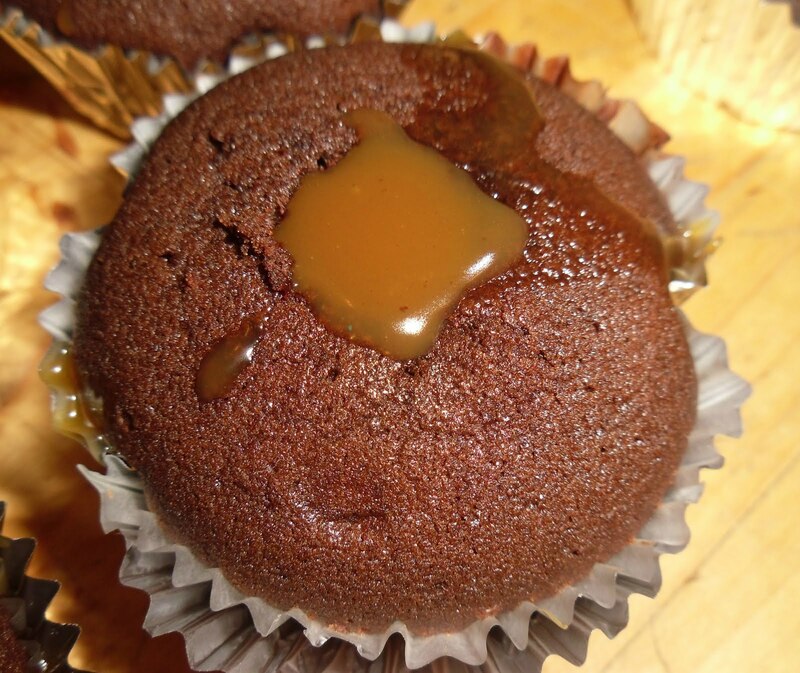 Once the caramel has cooled you want to fill the center of the cupcakes up with the caramel. 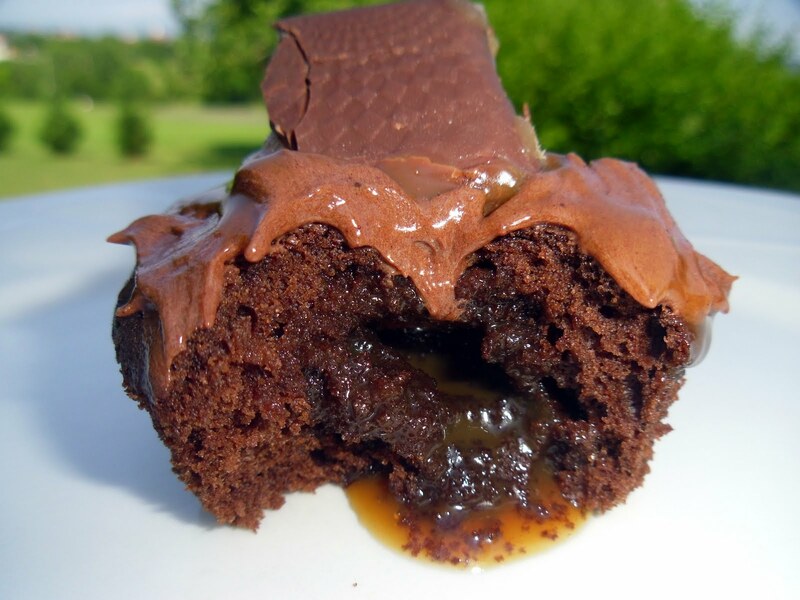 It’s going to sink a little especially if your caramel is still warm so fill it up again! It’s going to sink a little more again you can either fill it up with caramel again OR you can pipe some frosting into it and continue on to frost the cupcake! 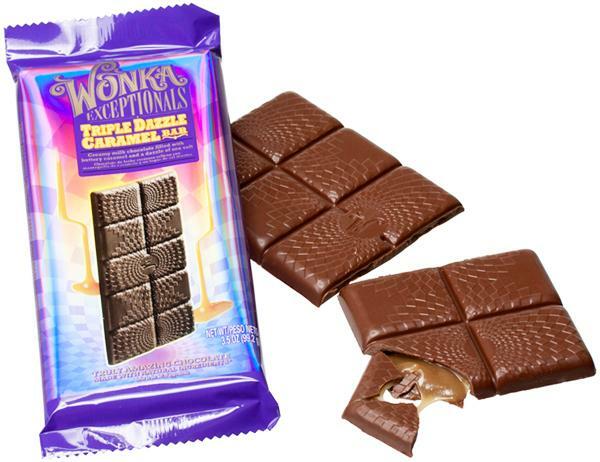 Once all the cupcakes have been frosted, top with the Triple Dazzle Wonka Exceptionals bars! This is what they look like when you eat them directly have making them. Once the caramel has cooled completely they look a little different but still DELICIOUS! 1. Preheat your oven to 325 degrees if you’re using a dark coated or non-stick pan. If you’re using a glass pan preheat your oven to 350 degrees. Bring two cups of water to boil. 2. 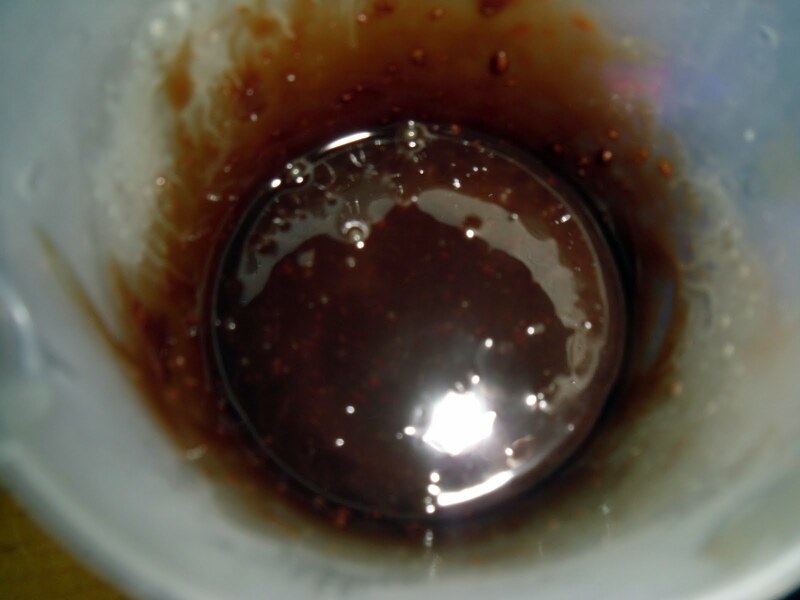 Combine 2 cups boiling water and 1 cup dutch process cocoa and stir. Let cool. 3. 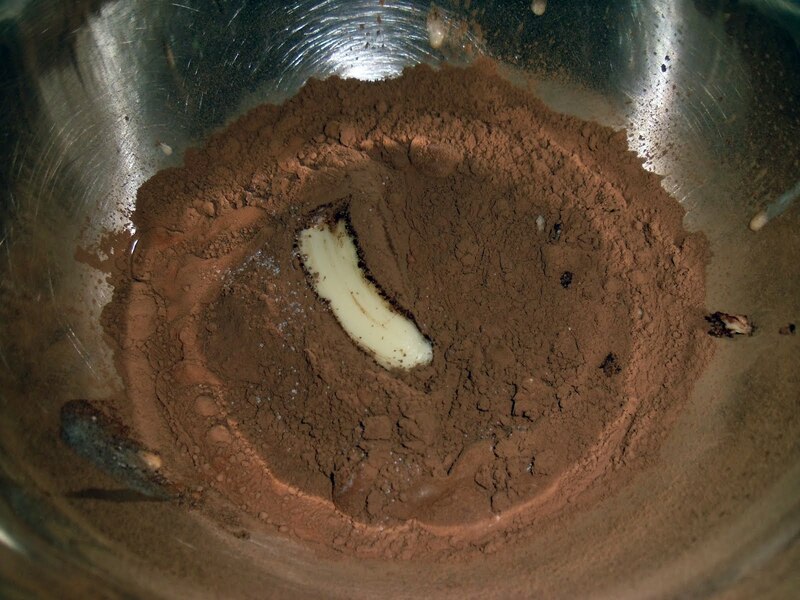 While the cocoa mixture is cooling beat 1 cup of butter until creamy, gradually add 2 cups of sugar and then 4 eggs one at a time beating in between each addition. 4. Combine 2 3/4 flour, 1 tsp. 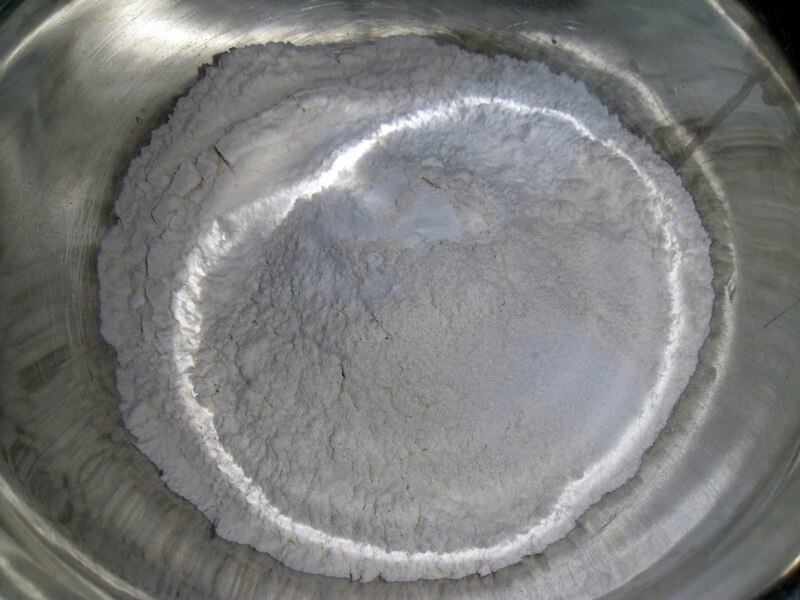 baking soda, 1 tsp. 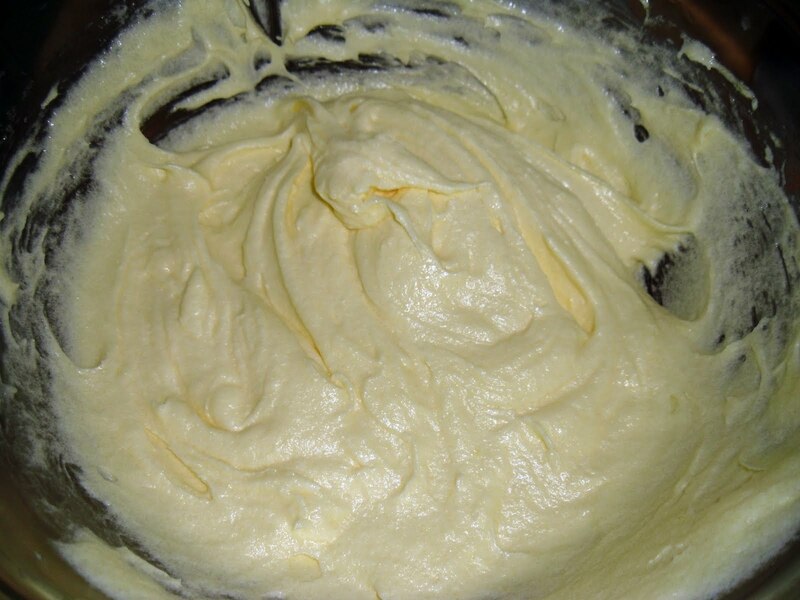 baking powder, 1/2 tsp. of salt. 5. 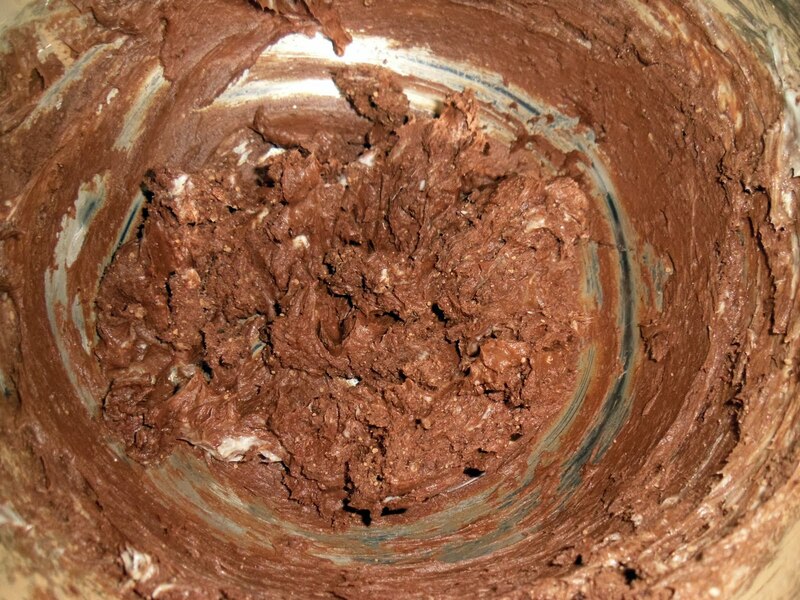 Add the flour mixture and the cocoa mixture gradually to the butter mixture alternating and beating between every addition. 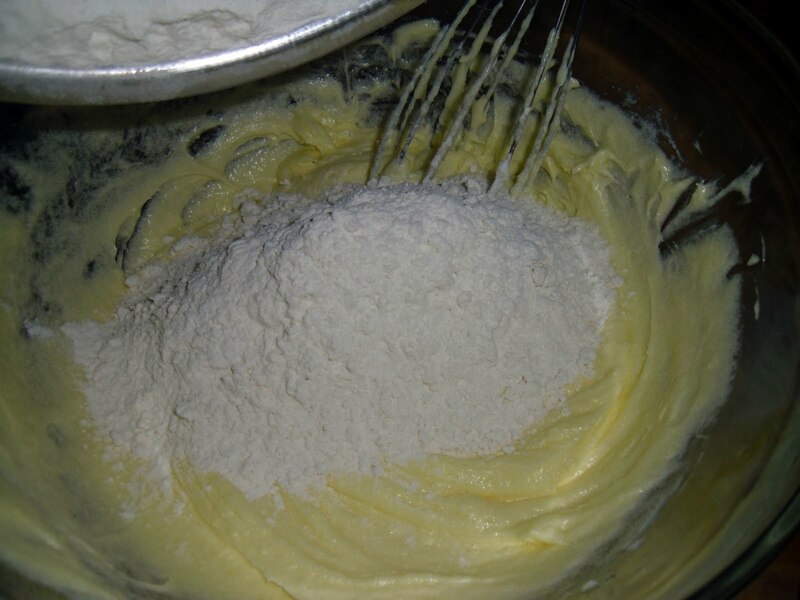 Start and end with the flour mixture. 6. 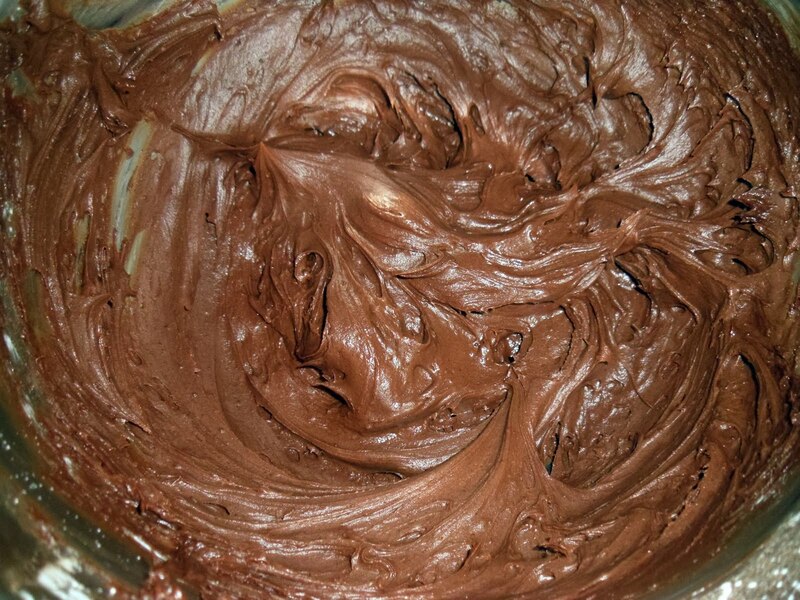 Take half a bar of Fantabulous Fudge and 2 tablespoons of whipping cream, melt in microwave for about 30 seconds, combine and add to chocolate cake mixture. 7. 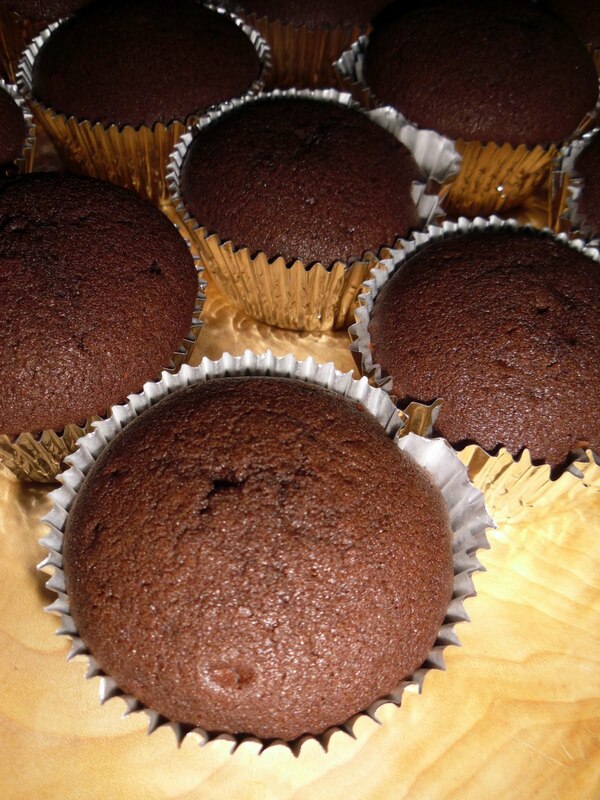 Line muffin tins with cupcake liners and fill with batter. Bake for approximately 15 minutes. 8. 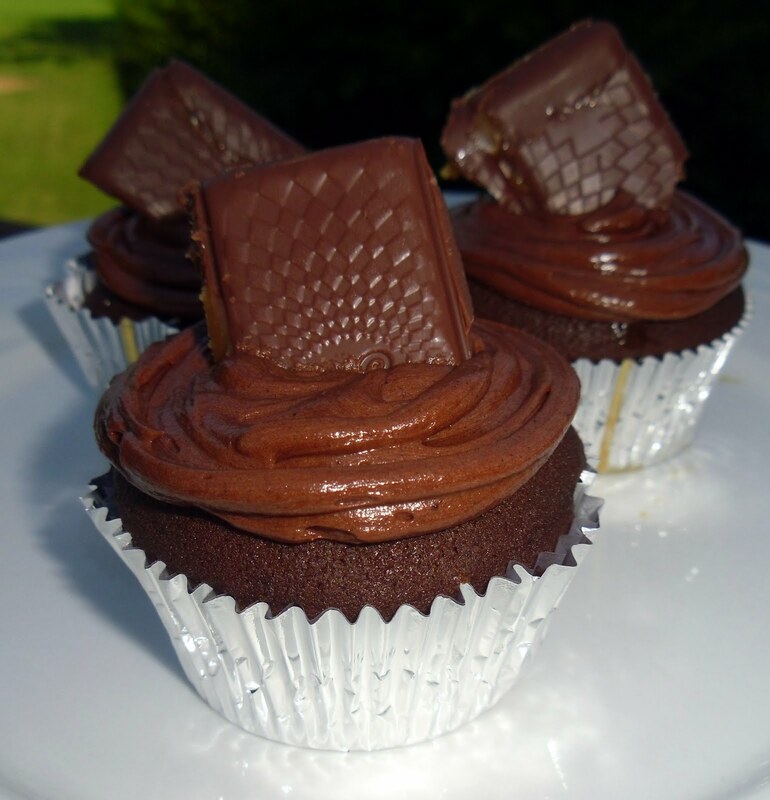 While the cupcakes are baking you want to make the icing. 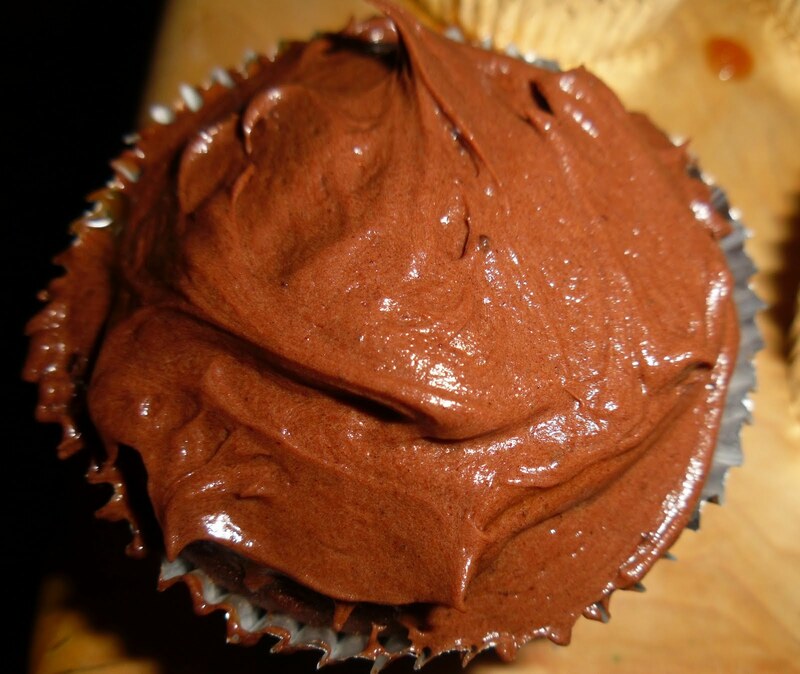 For the icing combine 1/2 cup butter, 1/2 cup unsweetened cocoa, 1/3 cup of whipping cream, and 1/8 of a tsp of salt. Once combined slowly beat in 16oz of powdered sugar. 9. Take cupcakes out of the oven and cool. 10. Now it’s time for the caramel filling. Cook butter and sugar in a saucepan over high heat, stir occasionally for about 4-5 minutes. 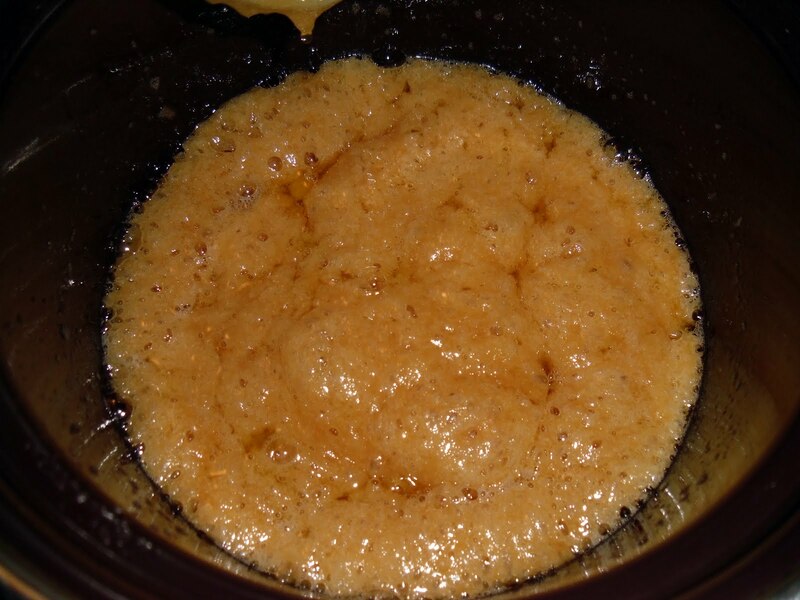 The mixture will be caramel-colored. 11. 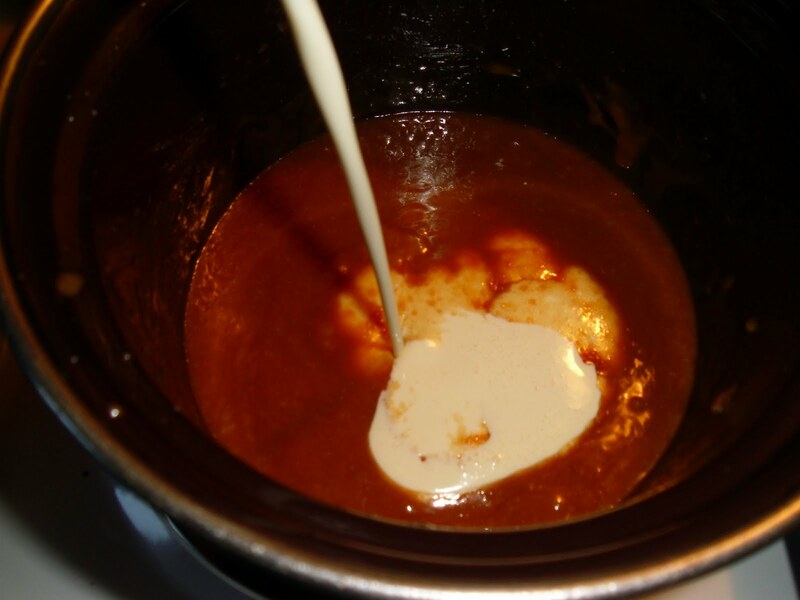 Remove the Caramel from the heat, SLOWLY add cream, stirring constantly. Return to heat and bring to a boil, cook for another 1-2 minutes. Cool before using the filling! 12. 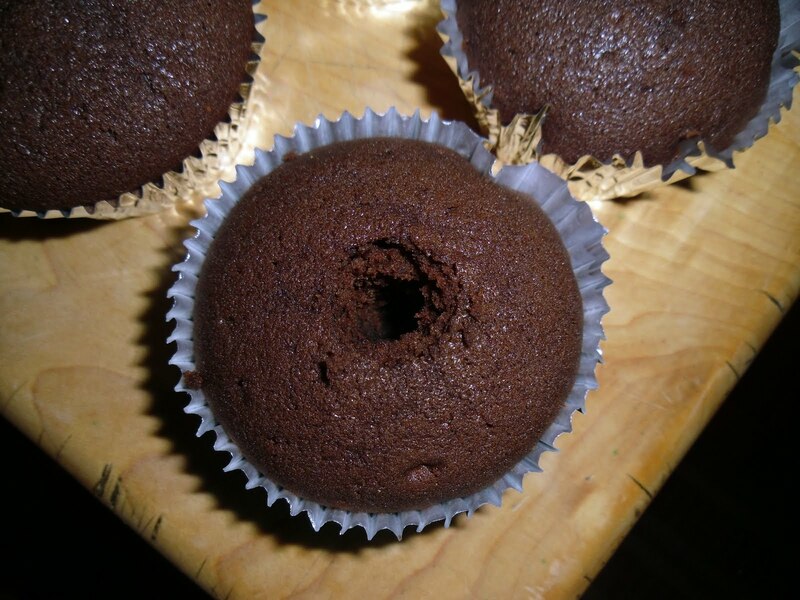 Now that the cupcakes are cool you want to take the end of a wooden spoon and push holes in the center of the cupcakes. 13. 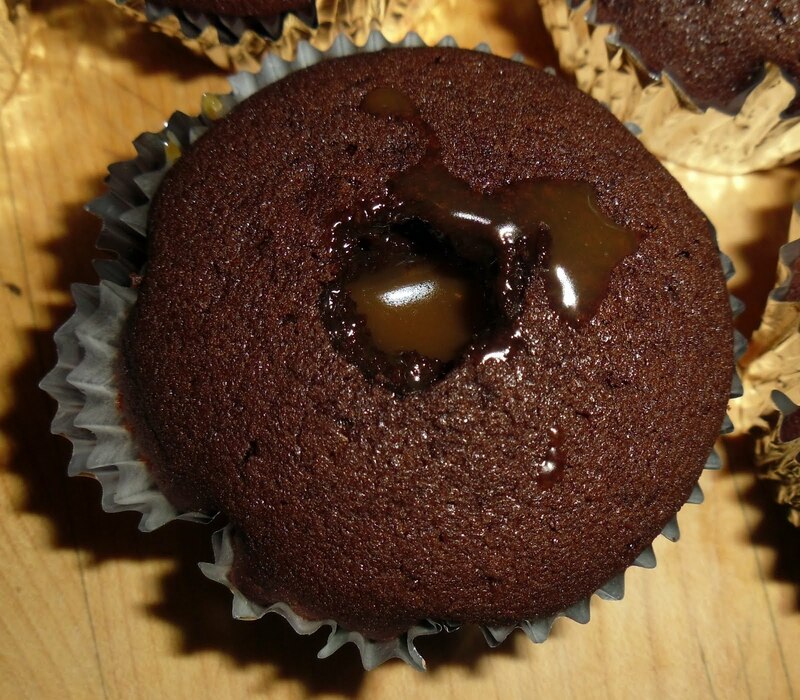 Once the caramel has cooled fill the center of your cupcakes with the caramel filling. This may take two tries since the first one will go into the cupcake a little. 14. Next step is to ice the cupcakes. You can use a piping bag and tip like I did or just use a butter knife. 15. 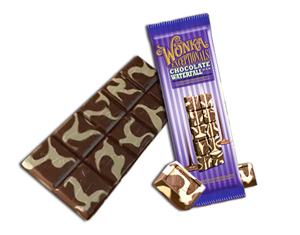 Top with a piece of the Triple Dazzle Caramel Wonka Exceptional Bar! 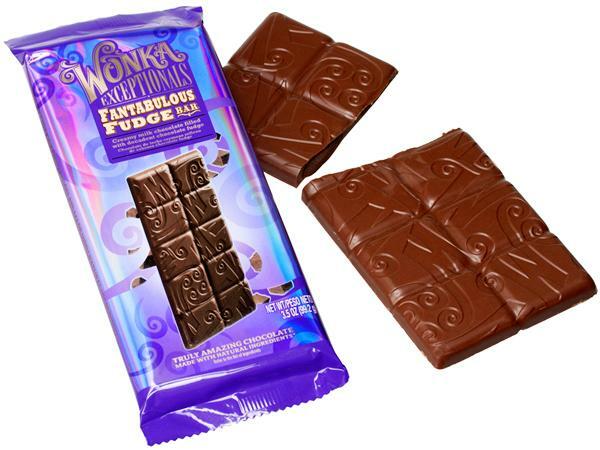 Disclosure: The inspiration for this post was provided by Willy Wonka Exceptionals. I was provided with the chocolate free of charge, the decision to make a recipe out of the chocolates was my idea and not asked of me. All opinions are 100% my own! Those look awfully amazing. Great idea. Wow these definitely look delicious! lets try this…look so yummylicious!